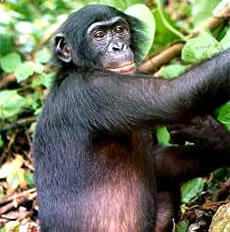 The pygmy chimpanzee or bonobo is found in the forests of the Democratic Republic of Congo. It is the least known of the great apes because it is only found in a remote rainforest region. It is closely related to the chimpanzee, and it was only identified as a species in 1933. Pygmy chimpanzees are similar in appearance to chimpanzees except for their smaller body weight, slender build, and longer limbs. Also, the head and ears are noticeably smaller than the chimpanzee, and the hair is longer. The facial skin is darkly pigmented, and the hair is black, usually parted in the middle of the head with bushy sideburns on both sides. Pygmy chimpanzees are knuckle-walkers, although they can walk upright and do so more frequently than chimpanzees. Males are much larger than females and their average height is 3.9 feet. The average height of females is 3.64 feet. Unlike the chimpanzee, which lives in a variety of habitats, the pygmy chimpanzee is found primarily in lowland rainforests. They prefer to sleep and eat in the trees, and they spend much more time in the trees than other African apes. Diet consists primarily of fruits, leaves, and pith from stems. 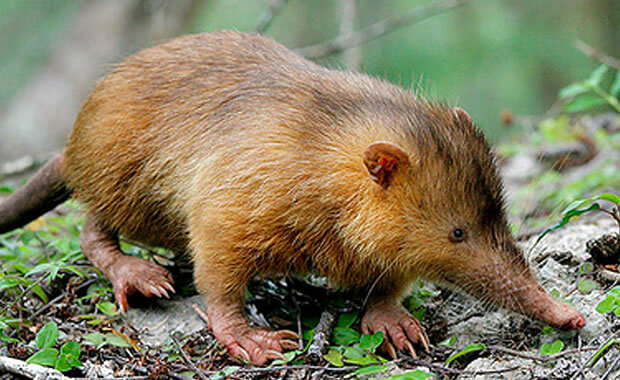 They are also known to eat insects and will occasionally hunt and eat small mammals. They have also been observed slapping water up from streams and eating invertebrates and fish. They are very intelligent and social creatures, and groups of 150 members have been observed. For foraging and travel, they may split into smaller groups of three to six. Females will mate with any male in the group and give birth to one young after a gestation period of eight months. Pygmy chimpanzee populations have declined mainly due to hunting for their meat and body parts which are used in religious rituals and for medicine. They are also threatened by habitat destruction due to increasing human population. Some are also trapped by snares set for other creatures in the area. There are no valid population estimates, but it is known that they no longer occur in much of their historical range. This species is protected by law, and international trade is prohibited. Although hunting is still a problem, the pygmy chimpanzee is found in the Salonga National Park which is a protected area. Also, the Great Ape Survival project has been established by the United Nations Environmental Program (UNEP), which aims to identify the conservation efforts (and gain the appropriate political and financial support) needed to preserve the species. Copyright Notice: This article is licensed under the GNU Free Documentation License. It uses material from the Wikipedia article "Bonobo". Glenn, C. R. 2006. "Earth's Endangered Creatures - Pygmy Chimpanzee Facts" (Online). Accessed 4/23/2019 at http://earthsendangered.com/profile.asp?sp=71&ID=1. Need more Pygmy Chimpanzee facts?